The Lincoln Navigator has been one of the most successful models built by Lincoln. Its production began in 1997 and underwent several revisions since then. Used Lincoln Navigator models from the first generation are still popular today. All models are categorized as a full-size luxury SUV. Despite the fact that the Navigator had 3 revisions, the engine options were never changed. Customers could choose between a 5.4 liter SHOC V8 or a 5.4 liter DOHOC V8. The transmission was coupled with a 4-speed or 6-speed automatic gearbox. The interior of the car featured leather seats as a standard option with white burl wood inserts and panels with a nickel covered analog clock placed on the dashboard. Lincoln engineers also worked on sound deadening and worked on extensive carpeting and wood inserts across the interior. 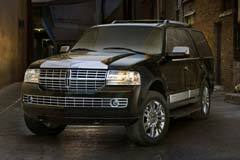 From the outside, the Navigator looked like a solid and large SUV with a large grill and an oversized front bumper. The headlights were designed to extend to the sides.